The Cuisinart PTK-330 PerfecTemp teakettle has a precise temperature gauge which indicates the correct water temperature to provide the ideal cup of tea or coffee. It offers the perfect brewing temperature which yields the best tea flavor and allows the realease of antioxidants. The PTK-330 has a built-in porcelain enamel exterior and interior with iron core which heats up quickly and retains heat well. Also reduces unnecessary boiling or re-boiling by always knowing the exact water temperature. 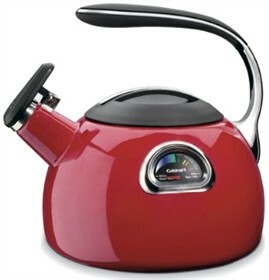 The 3 quart Teakettle allows you to enjoy the aromas, body and overall character of teas like never before. The Cuisinart PTK-330R has many exciting features for users of all types. You can extend the lifetime of your Cuisinart PTK-330R with the purchase of a FactoryOutletStore Factory Protection Plan. The Cuisinart PTK-330R is sold as a Brand New Unopened Item.